Every 22 minutes in the U.S., an injury from a shopping cart sends a child to the emergency room, according to new research that finds voluntary safety standards fail to protect kids in the grocery store. Between 1990 and 2011, about 530,500 children under age 15 were hospitalized due to a shopping cart-related injury, which translates to more than 24,000 children a year, or 66 children each day, according to the new study by Nationwide Children’s Hospital in Columbus, Ohio, published in the January issue of the journal Clinical Pediatrics. Dr. Michael Ross, a pediatrician at Eastern Maine Medical Center in Bangor, urged parents to exercise caution when placing children in shopping carts. “While we aren’t seeing the same injury rate as suggested in the study in our area, about every six months or so I see patients that have had a fall from a shopping cart related incident,” Ross said in a press release about the new research. Falls from a shopping cart accounted for the majority of injuries, about 70 percent, followed by running into or falling over a cart, carts tipping over, and getting body parts trapped in a cart. The most commonly injured body part was the head. While soft-tissue injuries were the most common type of head injury, the annual rate of concussions and internal head injuries rose by more than 200 percent over the study period, to 12,333 in 2011. Most of the increase, which occurred despite the implementation of voluntary shopping cart safety standards in 2004, was associated with children under age four. The study’s authors suggested improving restraint systems, placing shopping cart child seats closer to the floor, educating parents about shopping cart safety, and encouraging stores to have their employees promote the use of cart safety belts. • Whenever possible, choose alternatives to placing your child in a shopping cart. • Always use the shopping cart safety straps. Be sure your child is snugly secured in the straps and that the child’s legs are placed through the leg openings. If parts of the cart restraint system are missing or not working, choose another cart. • Use a cart that has a child seat low to the ground, if one is available. • Make sure your child remains seated. • Stay with the cart and your child at all times. 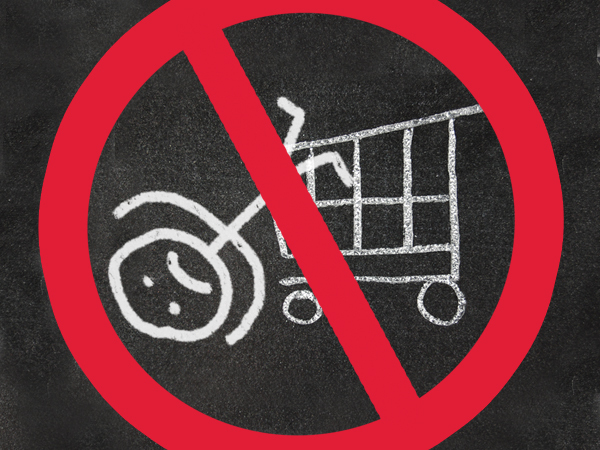 • Avoid placing infant carriers on top of shopping carts. If your child is not old enough to sit upright in the shopping cart seat, consider leaving your child at home with another adult while you’re at the store, or use in-store child care areas, a front- or back-pack carrier, or stroller.